It’s springtime. Birds are chirping, the sun is shining, the grass is growing, and its BASEBALL SEASON. I grew up a Bay Area sports fan, and continue to root for the Giants and the A’s, but my baseball fan-ship is rather complicated. 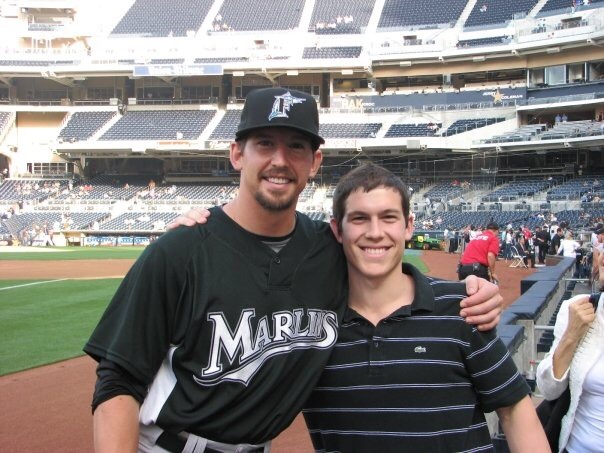 My Brother John played baseball at Cal, got drafted by the Oakland A’s in the Moneyball draft of 2002, and after 6.5 years in the minor leagues, made it to the big leagues in 2008 with the Florida Marlins. He spent 4 years with the Marlins, 2 with the Padres, and one glorious year as a catcher with the Cubs before joining their coaching staff as a mental skills coach. Watching my brother make it to the top of his profession taught me a a few valuable lessons. Consistent work pays off. John was never the best player on his team. From little league to the majors, there was always someone on his team bigger, stronger, or more naturally talented than he was. But John worked tirelessly to improve, and when the talented people maxed out their skills and didn’t know how to get better, John would slowly bypass them. Watching John taught me that there are no shortcuts to becoming great. The long way is the only way. 2) When you do what you love, you won’t have to work a day in your life. John loved playing baseball, and luckily loved learning how to get better at baseball. He was always trying out new ways to eat, practice, and train that would give him a slight edge over his competition. His love helped him put in the work that was needed to become elite. If you can make a career out of something you love to do, you will love going to work every day. The most memorable moment of his career came on a rainy Chicago day in 2014, when he came in to pitch at the end of what turned out to be the longest game in Cubs history. He earned the win AND scored the winning run, immortalizing him in Cubs lore forever. The game was such a riot that Cubs blogger Danny Rockett wrote a song about it. Thanks to the wonders of the internet, I connected with Danny and added trombones to his epic tune. I don’t have much to say about Take Me Out to the Ball Game. If you are familiar with the melody, try figuring out each key by ear, and use the printed part as a way to check your work. Keep the words in your mind to inform your phrasing, and use whichever articulations best represent how you would sing the song. Strive for your best sound, and HAVE FUN!